« Motorhead, Let it Rock! Welcome to part 16 of my youtube favorites countdown. In this edition we’ll be bringing down the house with the Godfather of Soul, James Brown. Helped out by his Famous Flames, this performance of Please Please Please, is from the TAMI rock show, a 1964 concert movie. This performance, considered by Prince to be the greatest in rock and roll history, was the second to last act of the evening. According to legend, the Rolling Stones had the option to appear before or after James, and they chose to close it out. Keith Richards said it was the worst decision they ever made as Brown blew the roof off the joint, and the Stones, while playing well, couldn’t hope to match the energy JB created. This video is worth watching from beginning to end. James is in full control of his voice and body. Every grimace, yelp, and shake is one of utter perfection, the true work of a master. 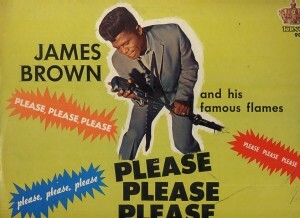 So, here you go, bow down to James Brown. This entry was posted on Tuesday, March 8th, 2011 at 12:40 pm and is filed under James Brown, Youtube Favs. You can follow any responses to this entry through the RSS 2.0 feed. You can leave a response, or trackback from your own site.